Not many people outside our state associate sunshine with Oregon, but those scenes of moss-coated Doug Firs in the Columbia gorge give way to a wide expanse of yellow stained hills as you move south and east through the state. Much of Oregon is a desert, and it is for that reason that solar and wind projects proliferate throughout the eastern part of our state. This morning’s site is a relatively new solar project, completed in 2016, just east of downtown. Developed, built and operated by Cypress Creek Renewables, the Neff solar site contains hundreds of trackers spread over 64 acres. The size of Neff project is 10 Megawatts: enough energy to power almost 2,000 homes. Solar and wind energy in Oregon is a burgeoning industry, with multiple new projects under construction throughout the state. While hydro, coal and natural gas still make up the majority of the state’s energy mix, Oregon now ranks 9th in the country for installed wind capacity and our solar presence is steadily climbing. This morning, the team is on-site bright and early to witness sunrise over the solar farm. We sip coffee and wait for the brisk air to give way to more amenable temperatures. Eventually, the sun reaches prominence on the horizon, and the trackers spring to life to begin the day’s slow, metered tilt tracing the movement of the sun. The community manager, Amy, has been working for Cypress Creek in Bend for four and a half years. She wears a lot of hats for the company. From land-use and construction permitting to solar regulation advisory committees, Amy does it all. She is also the primary contact between the greater Bend community and Cypress Creek. 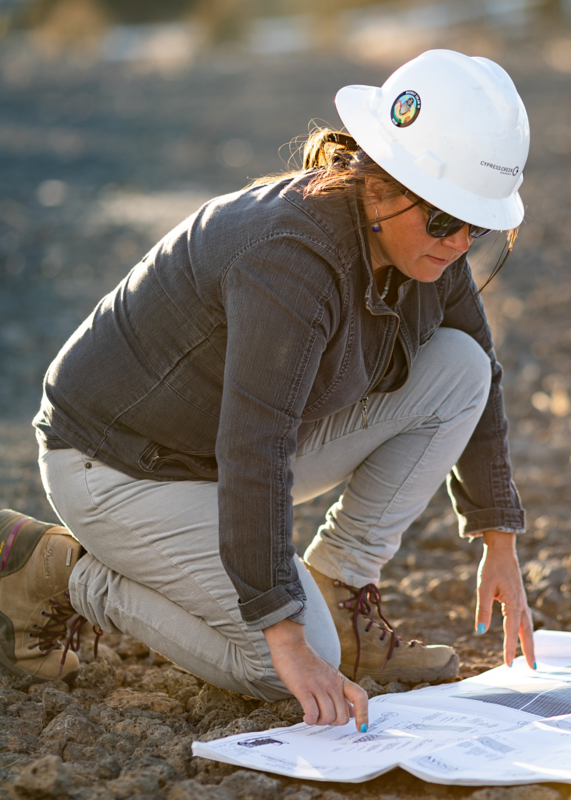 For her, the highlight of working for a solar company is being able to share her passion for renewable energy. The Neff site also contracted with a local commercial nursery to double as a re-vegetation project for native sage brush and wax currant. Around 800 of these shrubs were planted around the exterior of the site once construction was complete in 2016. The area is also plush with volcanic rock, characteristic of the Cascade Range. Although the sight of hundreds of photovoltaic panels isn’t necessarily commonplace yet, something about the area feels totally natural and calming: perhaps it’s the slow, steady cycle of the panels with the sun or the glow that comes off their surface throughout the course of the day. We finish up with a light show from the setting sun and a moment of quiet. Pink and orange reflect on the glassy surface of the trackers. We make our way back through a sea of panels, flat-topped for the night, the Western Cascades standing stark against nightfall. From this point of view, the future is strong. 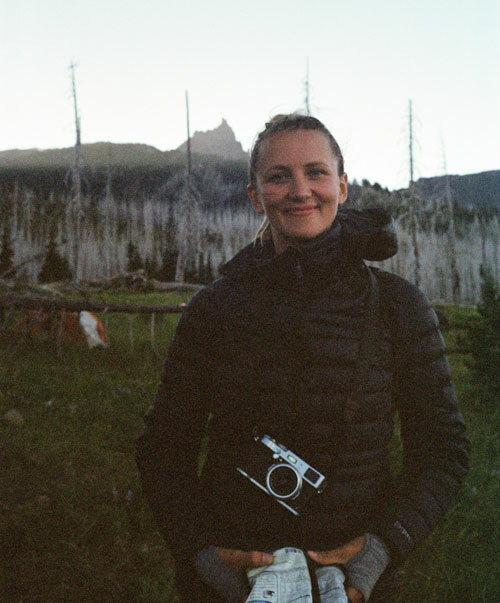 KATE MACIEJOWSKI is a Vermont native who's fallen in love with the Pacific Northwest. She's interested in the different versions of yourself that you can find when traveling, when taking a risk, when meeting someone new. In the winter months, you'll find her hunting fresh lines on her snowboard at Mt. Bachelor and she spends her summers surfing, camping and exploring. The rest of the time, her nose is in a book or she's writing something of her own.